Cocall is a new generation of electronic game calls with a very high-quality sound to successfully call and track the animal of your choice: moose, white-tailed deer, Canada geese, wild turkeys, coyotes, foxes, crows, black bears, etc. Cocall offers Micro SD memory cards with very high quality MP3 sound output; electronic calls equipped with a reputable amplifier that efficiently transmits the call; charge kits; and even communication modules with remote control (sound and volume). This means that you can play sounds from your cellphone with your Cocall while you sit comfortably in your hunting stand! 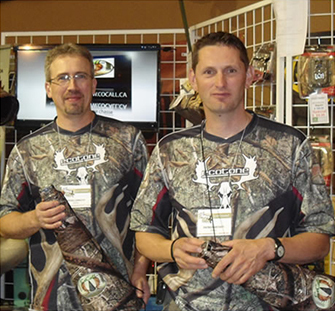 Used by many hunters, from the most experienced to beginners, the proven Cocall systems were designed in 2010 by two enthusiastic hunters from the Gaspé Peninsula, Michel Langlois and Patrice Méthot. With Cocall, you’ll get results! A nature enthusiast since my youth, every fall was devoted to hunting. Today, like many people, my time is precious, but I continue to go hunting every fall because I’m passionate about it. All this to say that successful hunting requires a lot of time spent practising calls. So, for those who lack the time but still need to call properly, we designed a quality electronic game call. You no longer need to practice your calls — you have top quality sounds at your disposal. For me, and undoubtedly for many hunters, Cocall is the ideal tool. A passionate moose hunter for over 20 years, I quickly understood that, to be more successful at hunting, we had to use the right sounds, especially during mating season. So we developed an electronic game call with the best possible sounds that all hunters could benefit from. Cocall is a new generation electronic call with a very high sound quality to call and track the animal of your choice! Cocall is a new generation electronic call with superior sound quality, helping you track the animal of your choice! Thank you, Cocall! Very nice sound! I made the buck come out using the Micro-SD for Cocall (sounds of a lone cow moose). I let it play for about 4 minutes and I waited. 10 minutes later, the little buck appeared. Congratulations again for your product. My Cocall will certainly be part of my hunting trip once again next year. Here in Michigan, hunting is a way of life. I have been hunting for many years, and I must say that the Cocall calling system is the best I have ever used. On my latest hunting trip to Canada, Cocall helped me score a beautiful moose. Thanks again!